If you’re following our blog closely (SURE you are! ), you probably saw this post about our difficulties in finding our next rental home. Just to recap, our current six-month rental is drawing to a close and we need to re-house by the end of November. After several unsuccessful months looking for another house to rent (we’ll leave the details to the other post) we finally realized we’d be better off buying a home. Now, understand, this is a sea change for us since we were always determined only to rent in Panama. So what changed our minds? It wasn’t just the tight rental market. After six months in country we realized that Panama is our home and we’re here for the long haul. So why not make it really official and become homeowners in paraíso? There are plenty of advantages to owning a home here vs. renting. Besides the fact that we won’t be flushing rent down the toilet anymore, we’re able to take advantage of a 16-year exemption from property taxes because the house was only built four years ago. (Brief explanation: at the time our house was built, all new construction was eligible for a 20-year exemption that can be transferred from owner to owner. However, we understand the law has just changed and the exemption is now only 10 years). And because we’re buying in one of Panama’s most popular tourist destinations, we can turn the house into a short-term or long-term rental or do a house swap when we take off on our own travels. Finally, there’s the market, which is still very much buyer-favorable here (although that seems to be changing). Lots of houses have been sitting on the market, some for years, and prices are still reasonable depending on what you’re looking for. In only a couple of weeks, we saw more houses for sale that we’d seen in the three months we had been looking at rentals. The Brisas house from the rear, looking across to the terrazzo. The house sits on a double lot with a huge and nicely landscaped back yard. 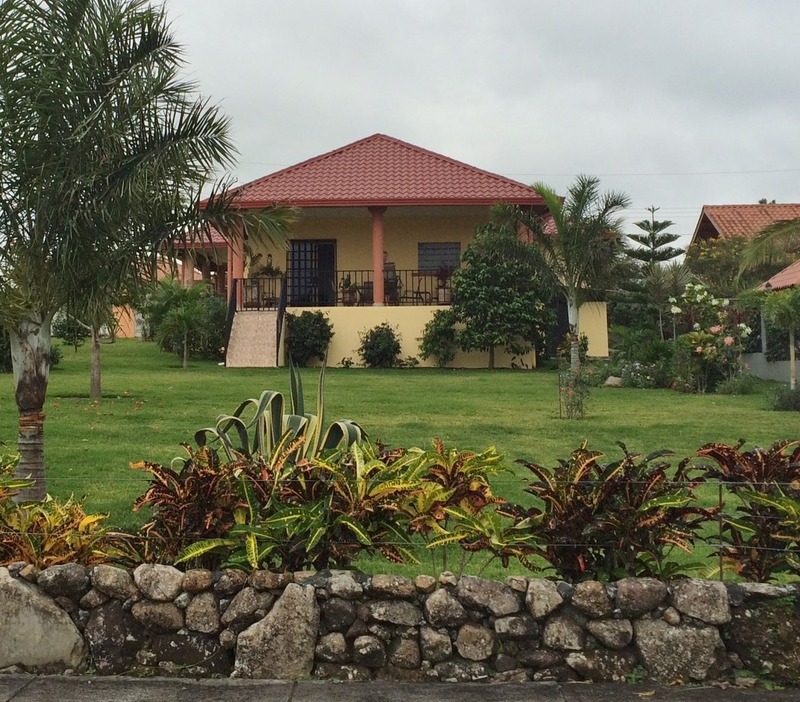 After strongly considering three other houses, we lucked into a wonderful property in a neighborhood called Brisas de Boqueteñas, about 8 km from Boquete’s main square. They say timing is everything – and this one, for sale by owner, came on the market just in time for us to be able to close before our Nov. 30 deadline. It’s neither too big nor too small, perfectly maintained, and beautifully landscaped. And here’s the best part: it’s fully furnished, right down to the dishes, pots and pans, linens, and even gardening tools. Since we moved down here with only six suitcases and two dog crates (dogs included) to our name, this house is a perfect fit. And the sellers, a lovely couple that is moving back to Canada, could not be nicer to deal with. So what’s it like to buy a house in Panama? So very different from the U.S. First of all, there is no multiple listing service, so it takes a lot of Web searching to get the big picture of what’s for sale in a certain price range. The realtors here (and I want to say this carefully, because it’s not meant as a criticism) tend to be very territorial. They typically show only their own listings, and It’s not customary to share listings or split commissions with other agents. We were making more progress on our own, and we actually found our house on one of the local expat blogs. Since the listing was a FSBO, we negotiated directly and informally with the owners and settled on a price, contingent on a survey and inspection. Regarding the inspection, it’s a whole different ballgame down here. There are home inspectors, but unlike the states, mechanical inspections aren’t a mandatory part of the buying process and the inspectors are not as thorough. Lucky for us, we got some help from two great friends, one of whom is a contractor building his own home here, and the other who is retired from a 30-year career as an architect and designed his Boquete home a few years back. With their intimate knowledge of Panamanian construction, these two amigos helped us go over the house with a fine-toothed comb. Their verdict: the house is in great shape and well worth the asking price. At that point, our attorney arranged for the survey and the lawyers on both sides took over and started drawing up a formal “promise to purchase” contract stating the legal process of conveying the property from the sellers’ corporation to our newly created foundation (a note about that below). Just last week, we all met in our lawyer’s office to sign the contract and we (gulp) made the down payment, to be held in escrow by the sellers’ attorney. Now that money has changed hands, we’re committed! On our lawyer’s advice, we drew up the paperwork for the house and contents to be held in a “foundation,” a less expensive and less complex option than a corporation. A foundation offers the same legal protections as a corporation but can’t be used for business purposes. Just a few days ago, we got the word that our new foundation had been officially registered with the Panamanian government. All that’s left now is for the lawyers to verify that there are no liens on the property and that the title is clear. SOOOO . . .If all goes according to plan (this being Panama and all, that’s a big IF! ), we will close within the next three weeks and take possession in the final days of November. It’s the smoothest and easiest experience we’ve ever had in buying a house. This time next month, we’ll be sitting on our new terrazzo, wine glass in hand, and pinching ourselves at how well things have fallen into place for us here. It was all meant to be! I am so happy for you Susan and John! Sorry I have been MIA for the past 3-4 months…. Nana duty! Will try to do better! Oh, Janis, that would be fantastic! Sounds like you’re planning a great Thanksgiving. All our love to you and your family. Congratulations. This is wonderful news. We are so happy for you. You will be sipping wine on your terrace in no time. Thanks, Deb – we’re excited! So happy for you!!!! What an exciting time! My husband just got to Boquete on Thursday and is beginning the hunt for a rental. We think that it will be difficult and may end up in David. Once the snowbirds go home in 6 months or so, we will hopefully end up in Boquete. I am joining my husband at the end of January and am hoping we will be able to meet you both…we are avid followers of your blog! I wish you all the best with the new home! Carrie, please stay in touch. We’d love to meet you and your husband when you come down in January. And if there’s anything we can do to help in the meantime, let us know. Wow, what a great turn of events. Congrats! We were able to lock down rentals from late March to mid-December. Will that take the border runs off the table by owning property? Thanks, Eric, and nice job on securing a rental. Nope, the only way to get off the hook for the border runs is to get a residency visa. Maybe you can come with us sometime to San Vito and we’ll show you the ropes. Congratulations. Looks like a lovely place. Hopefully you will continue to successfully navigate through the process and close in three weeks. Thanks – it’s looking positive! Congratulations John & Susan, we are so glad to hear that this has worked out for you and that it has gone very smoothly! We are so looking forward to getting there in 136 days, settling into our new apartment and starting our new life there. We are also looking forward to exploring our friendship with you guys. It will be nice to see you in your new digs. Sharon said to be sure to say HI to the both of you! Thanks, John! 136 days will fly by and you’ll be here before you know it. We look forward to getting to know you better. Let us know if there’s anything we can do to help. Thank you! So are you in Panama now? We are back in Ohio. Brrrr, it was 32 degrees at 08:00 this AM! I’ve long considered one of the worst 4 letter words to be S-N-O-W! Needless to say, Boquete looks beautiful to me. Do you remember how your minds were spinning after your first visit to Panama? We can see ourselves in Boquete, but the shedding of possessions to make that happen are mind-boggling. The shedding of possessions can be overwhelming – just eat the elephant one bite at a time! You’ll be surprised at how it all starts to fall into place. Awesome news on the home purchase. Crossing my fingers that the closing happens in the right timeline! Can’t wait to see more pictures inside and out! Thanks, Les. You and Terry should plan a trip down! So happy that things have been working out so nicely for you! A fully furnished beautiful new home? Can’t get much better than that! Congrats! Thanks, Becky! Are you sure you don’t want to cruise Ocean Star down here for a visit? We were so relieved to hear you weren’t affected by Patricia there in PV. Stay in touch! Congratulations!!! We’ve been wondering how the purchasing part works once one is done renting and have found a little area to call home :). Looks like the perfect place to settle down!! Love your new picture, Rebecca! Keep us posted on your plans. We have been reading your interesting blog about your move and living in Panama. We live in Dayton, Ohio, and have been researching retirement to Panama. We plan to make an exploratory trip to Panama on January 25th (or 26th) for 12 days. We are interested in checking out various areas (Nueva Gorgona/Cornado, Boquete, Las Tablas, and others you can suggest) ahead of our plan to move to Panama. We’re looking at potential move dates of Sept/Oct ’16 or late January ’17. We are estimating that we will stay in Panama 5+ yrs. Bill is 60 yrs old, Kim 54. We would love to meet you in person and hear your experience and advice. We are hoping to visit a few areas in order to decide where we want to live. Also, if any others reading the blog would love me to offer assistance to us, we would very much appreciate it! What things should with us on this exploratory trip to help us prepare for our relocation later in the year? Will we need a rental car? Thank you in advance for any advice you are able to provide! We look forward to hearing from you! Hi, Kim and Bill! We’d be happy to answer as many questions as we can. If you can post your email (I’ll take it down as soon as I have it) we’ll get back to you. Got it! We’ll try to get back to you today.